The 2016 Toyota Land Cruiser is already a legend, offering both unwavering off-road grit and the height of luxury for Daytona Beach and Palm Coast drivers. This is a machine that can trace its roots right back to 1957, and Toyota has continued to refine it to perfection. The result is a vehicle that cannot be matched by any other on the road today. 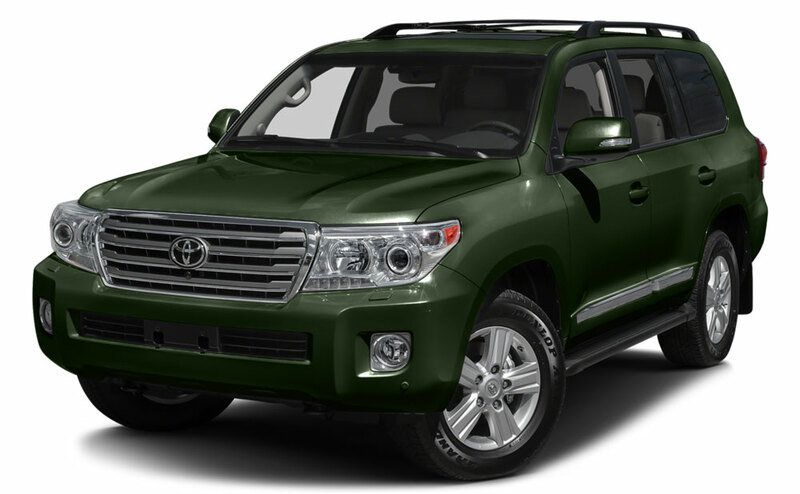 The 2016 Toyota Land Cruiser comes in only one trim level, underlining its uncompromising nature. Starting at $83,825, the vehicle comes with plenty of comfort and convenience technologies, as well as perforated leather upholstery and four-zone automatic climate control. Qi-Compatible Wireless Charging: Caught without power on your cell, but don’t have the appropriate lead? Compatible phones can be charged wirelessly after being placed on the Qi plate. Premium JBL Audio with Integrated Navigation: With 14 Synthesis speakers, a subwoofer, and an amplifier, plus navigation and a complimentary subscription to SiriusXM satellite radio, all accessed on a high-resolution 9-inch touchscreen. The 2016 Toyota Land Cruiser comes fully-loaded as standard, and that dedication to exclusivity continues when it comes to the powertrain. Only one is available, but who need options when you’re already looking at the best? Sitting beneath the hood of each and every 2016 Land Cruiser, Daytona Beach and Palm Coast drivers will find a fiery 5.7L V8. It generates the kind of power that a vehicle like the Land Cruiser demands: up to 381 horsepower and a monumental 401 lb-ft of torque. This year sees the addition of a new 8-speed automatic transmission system, with full-time four-wheel drive coming as standard. All told, you’ll earn up to 13 mpg in the city and 18 on the highway. The latest incarnation of the Toyota Land Cruiser has received a slight refresh to the exterior, with all-new sheet metal forward of the front clip, plus a new bumper, grille, and chrome body side molding. At the rear, you’ll find new taillights and LED brake lights. Standing on its new 18-inch alloy wheels, the overall impression is of a machine that commands your absolute attention. Those high standards continue inside. All eight passengers will experience first-class comfort thanks to multi-stage heated and ventilated front seats, a multi-stage heated 40/20/40 split second-row seat with center armrest, and a 50/50 split third-row seat. 16.1 cubic feet of cargo space comes as standard, but you can extend that right up to 81.7 cubic feet by folding the second and third rows. Kinetic Dynamic Suspension System: Uses hydraulics to adjust the lean resistance of the Land Cruiser’s stabilizer bars. Full-Time Four-Wheel-Drive: With a Torsen limited-slip locking center differential to redistribute power to the wheels with the most grip when needed and an Active Traction control for brake and throttle interventions to control wheel-spin. Multi-Terrain Select: Tailors stability and traction control settings to match your current terrain type. Dynamic Radar Cruise Control: Uses forward-sensing radar technology to maintain a preset following distance between you and the vehicle directly in front. Pre-Collision System with Pedestrian Detection: Scans for potential vehicle, obstacle, and pedestrian collisions, then provides an audible and visual alert. If you fail to respond, the brakes will be automatically applied if an accident can be avoided. Blind Spot Monitor: Provides a warning indicator on the appropriate sideview mirror as a vehicle enters your blind spot. Nothing this good passes by the industry’s critics. They’ve all lavished praise upon the new Land Cruiser. The 2016 Toyota Land Cruiser carries the crown when it comes to luxurious off-roading, able to cater to those two disparate demands without breaking a sweat. To take one out for a spin, just contact the team at Beaver Toyota today. We look forward to putting our Daytona Beach and Palm Coast customers behind the wheel of this deluxe off-roading SUV!